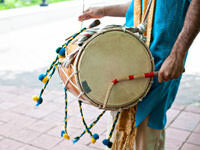 Our Dhol players (usually dressed in traditional Punjabi outfits) create a vibrant, heart-pounding atmosphere. 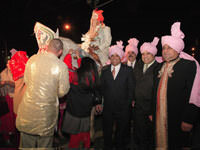 Our Dholis will give the Baraat a true traditional feel as they’ll lead the guests to the wedding venue. 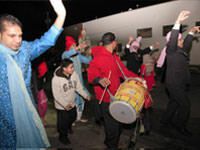 Towards the end of the Baraat, live Dhol can add excitement to the Milni ceremony. They will even walk the groom down the aisle to the mandap for a complete grand entrance. Our Dholis make sure everybody knows the groom has arrived! Can’t dance to only Dhol beats? Then perhaps a little Baraat music will get those feet moving. Depending on your taste in music, we play non-stop hits and MC on the mic to get the Baraatis in full swing and make sure all hands are in the air as the groom celebrates his last minutes of singlehood. Our interactive and energetic Dholis can play the drum in-sync with any type of music we play from our sound system to compliment the beats, including Bollywood, Bhangra, Baas, Dandiya, even Hip-Hop & Pop during open dance floor. Depending on your cultural background, we can play Harp, Classical, Shehnai, Nadaswaram, Qawali or fusion music to fill in those empty silent gaps. Is your cocktail/social hour being held in a separate room or area than the reception? No problem. 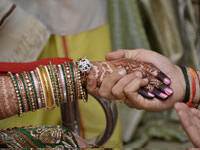 We’ll do a second sound set-up for back to back music as guests move from one room to another, and play light background music such as Bollywood instrumentals, Mehndi/Sangeet songs, Jazz, Orchestra Symphonies, or even Classic American love songs as your guests have appetizers, drinks, and socialize. If you’re looking for a non-stop dance party past the wedding or engagement ceremony, look no further for the perfect wedding songs that will keep your guests on the dance floor all night long. 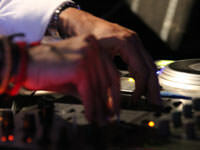 We will customize a play list prior to the event so that you and your guests get to enjoy all your favorite songs. As a master of ceremonies (MC) we make sure your planned event runs smoothly and we guarantee that everyone will be well informed and well entertained. We can also act as your event coordinator, making sure your guests, the photographers and videographers, the caterer and everyone involved are aware of the events to follow. 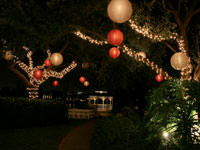 Holiday Parties such as Diwali, Holi, Christmas etc. Specialty Themed Parties such as Bhangra party, Bollywood party etc. Professionalism exactly the way you would like it!